Splash induced by falling fruit. 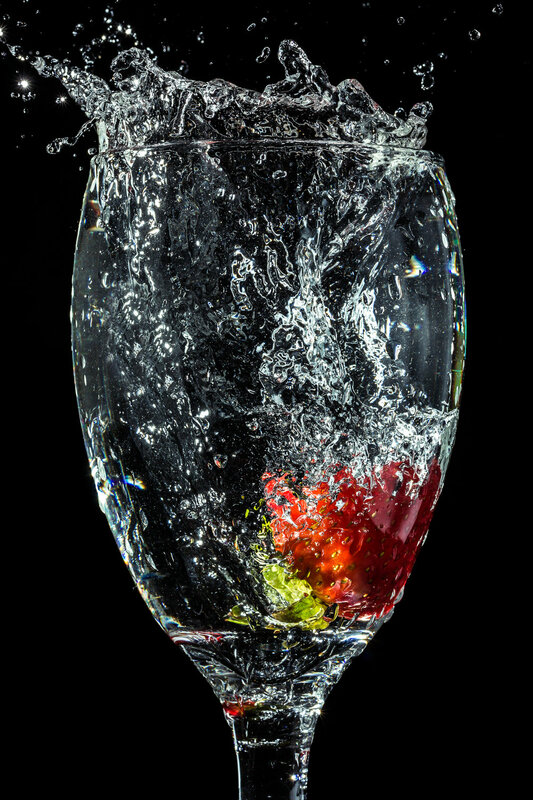 The water was captured using a flash pulse triggered by the sound of the fruit hitting the water. Four years ago I was a junior engineering student. It was a Thursday and there were no classes the next day due to a holiday. I had been wanting to try out some kind of high-speed flash photography for awhile so I decided to take advantage of the day off. My concept was to capture the splash of fruit falling into a wine glass. Flashes pulse for a very short period of time. The power setting of the flash is controlled by the length of the pulse. Using the flash in manual and choosing the lowest power setting will yield the shortest pulse time (on the order of 1/10,000 of a second). If the strobe is the only light source than it will freeze motion — regardless of the actual shutter speed (see my video above for more explanation about this phenomenon). It's not too difficult to darken a room and set a flash to it's lowest power setting. The challenging part is firing the flash at the perfect moment. Burst mode is not useful here because the flash needs time to recharge. I wasn't interested in a trial-and-error approach. I wanted to build a device that would automatically fire the flash at just the right time, every time. The next day I went to work on the photography side of things. I bought a wine glass and some different kinds of fruit. I started off with strawberries. I liked the images but thought they could be improved by a secondary color and added a lime to the mix. I used the lowest flash power setting (1/16) available on my flash (Vivitar 285 HV) in order to get the shortest pulse time. I'm not sure if this was really necessary; perhaps higher power (longer pulse) settings would have frozen the scene just as well. I zoomed the flash head to max-telephoto. The glass was lit by the bare flash. I think that I experimented with some lighting modifiers but apparently didn't like the result. However, I'm not sure this was really the best option. The bare flash left a harsh highlight on a portion of the glass which I didn't really like (and cloned out in some of the images). Me in 2014 dropping fruit into a wine glass. I programmed the software to fire the flash a few milliseconds after detecting the splash. I found that the images were more interesting with this configuration. The delay gave the splash above the glass and the bubbles inside the glass more time to develop into interesting shapes. I set the shutter speed to 2.5 seconds. The shutter speed was mostly irrelevant for these images since there was no ambient light. Aperture was set to f/14. Unfortunately I don't remember exactly why I chose this aperture. I imagine anything over f/8 would provide sufficient depth of field so I suspect I needed f/14 simply to correctly expose the image. Once everything was set up I spent a few hours taking images. I held a wired shutter release in my left hand. After firing the camera, I simply dropped fruit into the glass sometime before the end of the 2.5 second window. 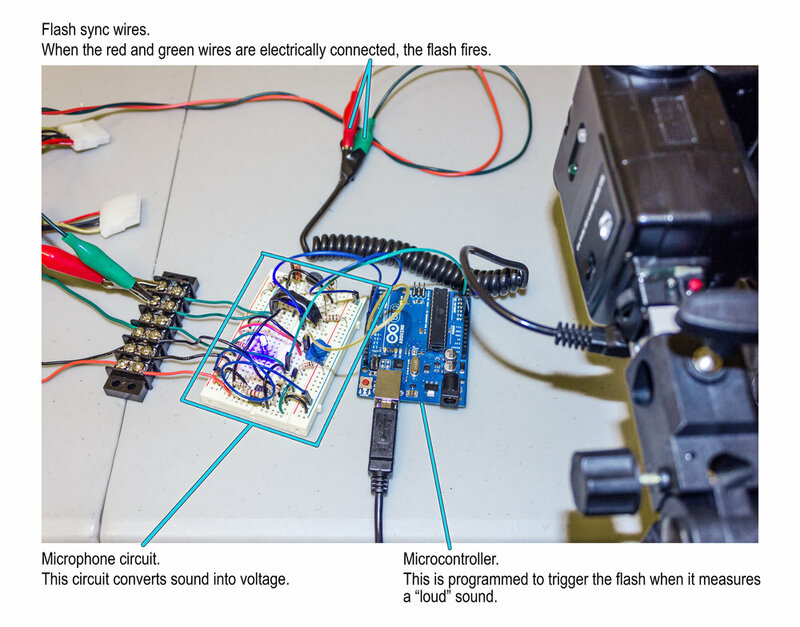 Since the flash was triggered by sound, it was completely autonomous. I programmed the microcontroller to trigger the flash 45 milliseconds after splash detection. Without this delay, the splashes and ripples didn't have enough time to develop into interesting shapes. This is also why the fruit is near the bottom of the glass in these images. Overall I was pretty happy with the results of this day-and-a-half experiment particularly since I had never done anything like this before. It was really fun to apply engineering skills to make something beautiful.